Attention Drummers: Pain or Problems Playing the Drums? Have you ever experienced pain or problems related to playing the drums? Even if you haven’t, Dr. Nadia Azar wants to hear about it! Playing the drums is a physically demanding task, but very little is known about the types of injuries, pain, or problems drummers experience, and the playing-related or lifestyle habits that might either help drummers avoid these injuries/problems, or put them at risk of developing them. 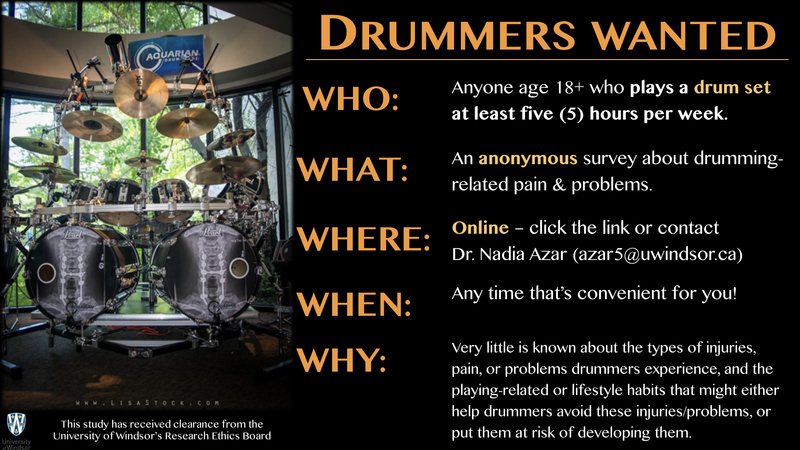 Nadia is looking for drummers to fill out an anonymous survey about drumming-related pain & problems. For this study, a drummer is defined as a percussionist who exclusively plays a drum set. For example, a drummer for a popular rock band, or a person who exclusively plays a drum set in an orchestra would fit this definition. A person who plays a drum in a marching band or drum line, or someone who plays the tympani or xylophone for an orchestra, would not. Play the drums a minimum of five (5) hours per week. Students enrolled full- or part-time in a college- or university-level music program. Full- or part-time drum teachers. Full- or part-time studio or live performance drummers from all musical genres. Retired drummers: you can still participate if you met these criteria before you retired. The survey will take about 20 minutes of your time. At the end of the survey, you will have the option to enter your name into a draw for one of ten $50 gift cards. This study has received clearance from the University of Windsor’s Research Ethics Board.